Long considered one of Warren Buffett’s favourite companies and top holdings, Coca-Cola (NYSE: KO) quenches the thirst of millions of yearning consumers and shareholders. And despite the fierce competition in the nonalcoholic-beverage space, the company’s ubiquitous brand, global dominance, and mighty financials pack a powerful punch. Let’s take a closer look at why Warren loves this company and why you should consider Coca-Cola for your portfolio. Coca-Cola has been labeled Interbrand’s “Best Global Brand” for 12 consecutive years. Founded in 1886, the world’s largest beverage company boasts 15 billion-dollar brands including Diet Coke, Coca-Cola Zero, and Sprite. The company sold 26.7 billion unit cases worldwide in 2011 equaling 1.8 billion servings per day of its 500 brands. In the past several decades, Coke has transformed itself from a carbonated-beverage company to one that includes juices such as Minute Maid and Odwalla, ready-to-drink teas such as Honest Tea and Fuze Tea, and sports drinks and waters such as PowerAde, vitaminwater, and Dasani. Coca-Cola’s recent quarterly earnings showed continued growth in emerging-market nations, with Q2 2012 unit case volume growth for China, Brazil, India, and Russia at 7%, 6%, 20%, and 9%, respectively. While case volume outside the U.S. already stands at roughly 80% of Coke’s worldwide volume, the company is aggressively pursuing growth in thirsty, relatively untapped emerging markets. Source: Coca-Coca 2011 Annual Report. Per capita consumption based on an 8-ounce serving. It’s easy to see why Coke — with one-tenth of the market penetration, nearly four times the population, and only 3% the per capita consumption of the U.S. — recently upped its multibillion-dollar investment in India. The company is waging a fierce war with PepsiCo (NYSE: PEP) to gain market share in the Asian nation. While U.S. customers guzzle at least one serving per day on average, Indian consumers sip a mere one serving per month. Coincidentally, the worldwide average per capita annual consumption is 92, so even if the Indian market grows to an average level of consumption, this represents enormous potential for Coke. Coke’s solid cash position, increasing sales and margins, strong free cash flow, and 2.6% dividend yield have contributed to the company’s success. 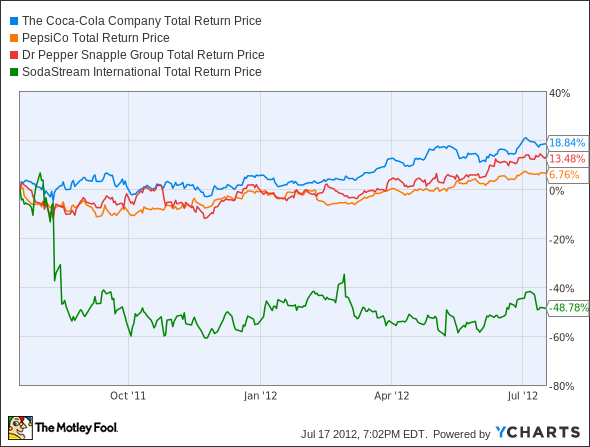 During the past 12 months, Coke has fared well versus its competitors and the overall stock market, providing a total return of nearly 19% since this time last year. Dr Pepper Snapple (NYSE: DPS) enjoyed roughly 13% during this same period while PepsiCo saw a nearly 7% gain. Meanwhile, SodaStream (Nasdaq: SODA) lost almost half its value. The S&P 500 was up nearly 7% during this same period. To supply many of Coke’s beverages with the 10 teaspoons of sugar needed for each 12-ounce can, the company literally buys mountains of sugar annually. Most of this sugar comes from corn — a key ingredient of high-fructose corn syrup. Historically, Coca-Cola has successfully hedged its huge commodity cost exposure, but the most intense U.S. drought in half a century may present a challenge. Coke’s input costs spiked up last quarter. And assuming companies such as Archer Daniels Midland (NYSE: ADM) — a leading producer of high-fructose corn syrup — raise prices, Coke’s input costs will continue their upward trend. Coca-Cola is worth a look because of the company’s timeless and ubiquitous brand, global dominance, emerging-market growth opportunities, and solid financials. But don’t take my word for it — do some research of your own.